There are numerous life insurance companies that are currently active in Canada. Below you will find a list of companies with links that you can click to find out more about each one. 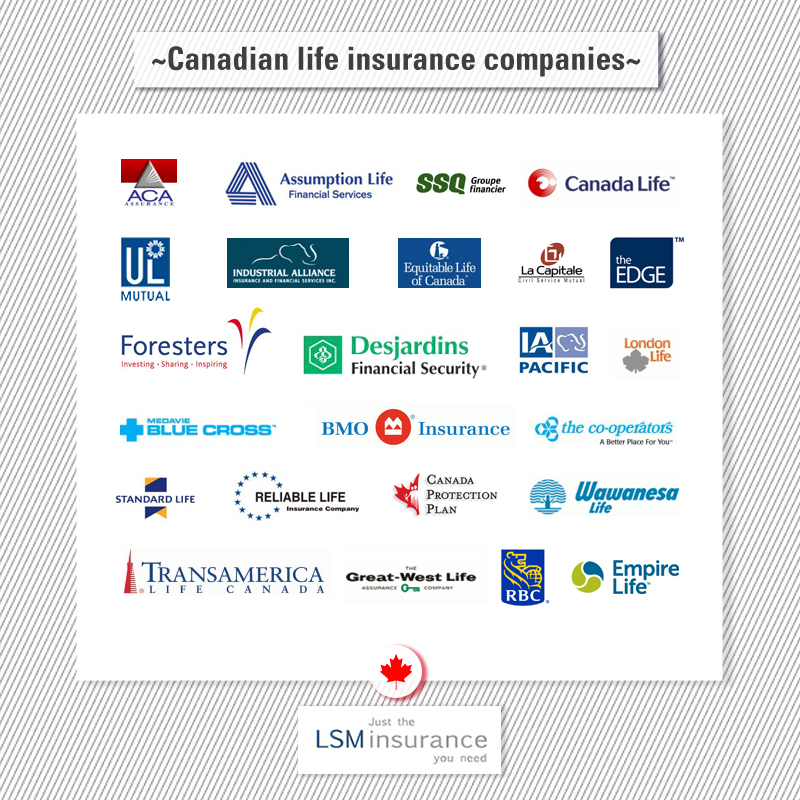 In 2018, the following three life insurance companies were the largest ones in Canada: Manulife Financial (includes the brands: Standard Life, Maritime Life, and John Hancock in the U.S.), Sun Life Financial, and Great West Life Assurance Company (includes the brands: Canada Life and London Life). Most life insurance companies offer a broad range of insurance products, including: term life insurance, whole life insurance, disability insurance, critical illness insurance, long-term care insurance, no medical life insurance, group insurance, and many more. I have several policies with the name of Mutual Life Of Canada What is the name change. Not sure if these policies have been cashed in. Mutual Life became Clarica and was subsequently purchased by Sun Life. You can contact them and they should be verify if the policies are still active. Thanks for the note there are no companies that would offer a 45 year term but you could do a term 100 plan which gives you level premiums to age 100 and coverage for life. I will email you with more specifics. It depends on the plan. Several companies insure applicants over 80 including Assumption Life, Industrial Alliance and Assumption Life. Where does the American income life insurance falls amongst these companies? Good article that list of Canadian Life Insurance Companies. Thanks for this list! Thanks for the note Vicki. Much appreciated. Does anyone know if Great West Life verifies if someone graduated from school? Please let me rate $1,000,000Term ins age 36 male non smocker. Thanks Sash. It would depend on your age nearest age and the length of the term. We offer targeted ad packages for as low as $.006 (almost half a penny per click) and test campaigns for as little as $15. Can I change the beneficary on my life insurance without the benficiary knowing. Hello my mom died and she have a life insurance name: The National Life Assurance Company of Canada. I am looking everywhere and can not find this company. Can someone please help me. Sorry to hear that – National Life was acquired by Industrial Alliance link to inalco.com. I got rated on my life insurance because of speeding tickets this makes no sense. I talked to the … agent and he I could re-apply after some of them are off my record. My car insurance went up but what does this have to do with life insurance. Could they have made a mistake and it went to the wrong department. Hi Rez, Generally speaking one or two speeding tickets would have no impact on your life insurance premiums. But multiple tickets, reckless driving etc and the insurance company may deem this as a hazardous lifestyle which impacts risk. Keep in mind each insurance company has it’s own underwriting criteria. So, it’s only the first couple of years you have a policy. Not the entire policy? I’m not sure what you are referring to. If you clarify we are happy to answer you question. I would like to file a claim on a Foresters life insurance policy. Hi Linda, Foresters contact details are below. How will I know that the insurance company will pay out the coverage amount once I die? Will they try to obstruct the pay out, or find a reason not to pay it out? Thanks Claire. Assuming your application questions where answered accurately and you do not die from an excluded death, suicide in the first 2 years or depending on the policy one of the the listed exclusions the policy will pay out. Having said that policies under 2 years or larger claims often take longer for the insurance company to process. A good broker can make sure all requirements are filled and can hasten the claim process. Thanks Steven – an irrevocable beneficiary means that both the policy owner and beneficiary must sign off on any changes to the policy. What factors go into ranking different insurance companies? In term of stability. Their assets, the types of assets, the amount of liabilities outstanding in relationship to those assets. Thanks for the note. You can call BMO Insurance for details at 1-800-387-9855. I would like to change my address? Thanks Hazel. If you click on the insurance companies name this take you to a page with their contact details. You can contact them and change your address. Just wondering if insurance policies have any restrictions on travel, residency. IE, do I have to live in Canada for a certain amount of a year, or are there no restrictions. Is it true that an insurance company can change or restrict your beneficiary under a current insurance policy you have and are paying for? Thanks. An insurance company can not change the beneficiary without the policy owner’s authorization. The elimination period refers to how long you must wait for your disability insurance benefit to kick in. I want to join your sales team I have 2 years successful experience in EFU life insurance company but my experience certificate has been misplaced. 8 years experience in Citibank dsa as a marketing team manager.If you give me a chance to work for your company, I shall put my maxumum efforts to increase your business. Thanks for the note. The premiums are influenced by a few variables. We will be in touch by email very soon to help with a quote. The Mortgage Life and Disability Insurance Products offered by BGS are Underwritten by Foresters Life Insurance Their plans offer Life and Disability Creditor Protection up to $500,000 of life to applicants 18 to 69 and $3,000 a month of Total Disability Protection to applicants 18 to 64 with No Health Questions and No Medical Tests. How exactly does the Bingham Group Services plan work and who pays out the claim? The Mutual Life Assurance Company of Canada is now which insurance company? Thanks for the note. Mutual Life became Clarica which was purchased by Sun Life. I am looking for a list of the companies that still offer Term 100 in Canada. I want a simple plan with out all the bells and whistles just guaranteed premium, no cash etc. Hi Ron, The number of Term 100 providers is shrinking. But Manulife, BMO, SSQ and Industrial Alliance still offer Term 100 plans. As do smaller carriers like La Capitale and Western Life. The premiums depend on your age, smoking status and the amount of coverage. We will send a separate email now. Hi… I am inquiring about the differences between the different insurance companies? For example, if I want a 200K UL. I am a 32yo female nonsmoker. What is the difference between the different options? The differences can be significant, especially if you are looking for a level cost Universal Life plan. Many companies have exited this market. What happened to Union of Canad? I was curious if my premiums would be higher as a firefighter compared to the average low risk occupation? Thanks for the note Derek. All things being equal firefighters do not pay a higher rate than other occupations. John, that depends on whether you can “no” to some of the questions on the Simplified Issue no medical plans. The more questions you can answer “no to the higher the coverage. We will send you a separate email now. Fraser, you would have to supply medical evidence to get an improvement in classification. Most insurance companies require you to be tobacco free for 12 months. How much non-medical term life insurance is it possible for me to buy in Canada? I’m a male 45 years old have been a non smoker for the past 5 years but smoked for 20 years prior. My policy needs renewing, would I now be considered a non-smoker and would that be reflected in my premium? Hi…I am 56, shopping for life insurance…very confusing…Would appreciate any help, advice etc! BMO Insurance’s Customer Service Centre number is 1.800.387.9855. Thanks for the note. It’s hard to say which company or plan is best without looking at your individual situation. The premiums vary among carriers, the cost will be influenced by you age, smoking status, Health and coverage amount. We will send you a separate email now. We are 4 in our family. My wife and I have Life insurance (I believe its term) and kids have ins. to cover funeral all through LL. I have a house and an additional investment property with another investment property to come in the next month. Mortgage ins is through RBC. Very expensive. Will call LL next week to discuss but should I be considering a different insurance carrier? Should I convert to a permanent? Thanks for the note. We will be in touch by email to see which plan is the best fit. 37 year old male with Hep B condition since 2yrs but undercontrol and no medication looking to have a term life ins that will cover life or life ins for limited amount. Have mortgage and of course would like to safe on ins as money is tight. Thanks for the note. You would have the contact the insurance carriers directly to see if they would have interest in your product.